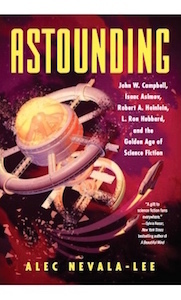 I’m delighted to share the news that Astounding is a 2019 Hugo Award Finalist for Best Related Work, along with a slate of highly deserving nominees. (The other finalists include Archive of Our Own, a project of the Organization for Transformative Works; the documentary The Hobbit Duology by Lindsay Ellis and Angelina Meehan; An Informal History of the Hugos by Jo Walton; The Mexicanx Initiative Experience at Worldcon 76 by Julia Rios, Libia Brenda, Pablo Defendini, and John Picacio; and Conversations on Writing by Ursula K. Le Guin and David Naimon. It’s a strong ballot, and I’m honored to be counted in such good company.) It feels like the high point of a journey that began with an announcement on this blog more than three years ago, and it isn’t over yet—I’m definitely going to be attending the World Science Fiction Convention in Dublin, which runs from August 15 to 19, and while I don’t know what the final outcome will be, I’m grateful to have made it even this far. The Hugos are an important part of the history that this book explores, and I’m thankful for the chance to be even a tiny piece of that story. Science fiction offers a thriving audience for short stories, but it can be hard for beginners to break into professional markets, and even established writers can have trouble making consistent sales. We’ll discuss strategies for writing stories that are compelling from the very first page, based on the principles of effective characterization, plot structure, and worldbuilding, with examples drawn from a wide range of authors and publications. During the class, Alec will plot out the opening of an original SF story, based on ideas generated by participants. Members will also have the option of submitting a short story for critique. You can register for the event here. If you use the coupon code “12345,” you can get twenty percent off the registration fee. Hope to see some of you there! The trouble with most who would write poetry is that they are unwilling to throw their lives away. Note: I’m taking some time off for the holidays, so I’m republishing a few pieces from earlier in this blog’s run. This post originally appeared, in a slightly different form, on November 21, 2017. When you look at the flood of stories that have appeared over the last two years about sexual assault and harassment, one of the first things that leaps out is that most of the cases still fall under one of three broad headings: politics, entertainment and the media, and technology. In each category, a single paradigmatic example—Donald Trump, Harvey Weinstein, and Uber—seems to have catalyzed the conversation as a whole, and you could argue that it was the Access Hollywood tape, for which its offender paid no discernible price, that really motivated this overdue reckoning. Yet there are countless other professions that haven’t received a comparable amount of scrutiny. The restaurant industry has gone through a similar moment of truth, but there are many more that have mostly eluded major coverage, even through the conditions appear to be largely the same. (Gender disparities seem like a pretty good predictor of the prevalence of harassment, and if I were an enterprising investigative reporter, I’d systematically look at professions in which the percentage of women is less than, say, thirty percent. Glancing over recent data from the Department of Labor, you find such fields as environmental science, chiropractics, architecture, security and police, civil engineering, and many manufacturing jobs. There’s no reason to believe that these industries are any worse than the ones that I’ve listed above, but I also can’t imagine why they would be any better. And the same might hold true, for different reasons, of jobs in which women far outnumber men, like kindergarten teaching, speech therapy, and secretarial work.) But it’s worth asking why we tend to focus on three relatively closed worlds that account for only a tiny fraction of all workers in the United States. In a way, these campaigns help us to care about issues not because of their inherent justice or importance but because we have the accessories to go with them: Nike shoes, Pepsi, a sweater from the Gap. If we truly need the glittering presence of celebrity logos to build a sense of shared humanity and collective responsibility for the planet, then maybe brand-based activism is the ultimate achievement of branding. According to Gerard Greenfield, international political solidarity is becoming so dependent on logos that these corporate symbols now threaten to overshadow the actual injustices in question. Talk about government, talk about values, talk about rights—that’s all well and good, but talk about shopping and you really get our attention. Replace “the planet” with “women’s rights” and “shopping” with “celebrities,” and you’ve got a compelling explanation for why the emphasis has been on politics, entertainment, and Silicon Valley. If these fields have one thing in common, it’s that they depend on creating the simulacrum of an emotional bond where none exists, and we naturally react strongly when it’s disrupted. It would be very nice indeed if all of the information fed into the sending end of a communication channel came out perfectly at the receiving end. But this never happens. Something always happens on the way to spoil things, making the number of bits received always less than the number sent. This “something” is divided into two parts—attenuation and noise. Attenuation is the loss of energy always observed whenever energy is transmitted through any physical system. What we call the signal, the information-bearing energy, is always weaker at the receiver than at the transmitter. This energy loss is the attenuation. In the case of some of the industries that I’ve mentioned, the distance between the sending and receiving end for news is dauntingly wide—it would take a grueling, potentially unrewarding effort of reporting to uncover instances of harassment in the world of chiropractics, for instance. For many of the fields that have received the most attention, by contrast, the attenuation is essentially zero, because some of the victims are physically, professionally, or personally adjacent to reporters. (In the cases of Leon Wieseltier of The New Republic or Glenn Thrush of the New York Times, not to mention Charlie Rose, many were journalists themselves.) With regard to Silicon Valley, politics, and entertainment, a sizable percentage of the stories that have broken over the last month or so involve men and women within reach of writers who are in a position to get such articles into print, in large part because they’re already there. This isn’t meant to minimize the enormous achievement and courage of this coverage, and it may well be that some of these fields are truly worse than average. (As Sheelah Kolhatkar put it last year in The New Yorker: “The entertainment business…seems almost uniquely structured to facilitate the exploitation of women, with generations of young actresses trying to climb a career ladder but and controlled by male producers and directors.” The power dynamic within politics can hardly be any less toxic. And I’ve written elsewhere of the phenomenon, far from unique to Silicon Valley but certainly rampant within it, that I’ve called the revenge of the nerds.) But I think it’s important to recognize that what we’re witnessing now is still closer to its beginning than to its end, and that its next big test is how it evolves to tackle less visible and glamorous subjects. What we already have can best be understood as a crucial leading indicator, with stories that benefit from intense reader interest, a high existing concentration of reporters, and victims who in some cases have relatively greater resources—technological, social, financial, racial—to bring their stories to light. Given the immense obstacles of all kinds involved in sharing such accounts, no matter who you are, that’s probably the way it had to be. But there are many others who are voiceless. Telling their stories will require an even greater display of sustained diligence, concentration, and empathy, in industries and communities that may only have a handful of reporters, if any, covering them at any one time, which only makes the barriers of attention and attenuation more daunting. What we’ve witnessed is staggering in its bravery, thoroughness, tenacity, and commitment to the values of journalism at its best. But it’s only going to get harder from here. Our recent poetry is…a poetry in which the poem is considered to be a construction independent of the poet. It is imagined that when the poet says “I” in a poem he does not mean himself, but rather some other person—”the poet”—a dramatic hero. The poem is conceived as a clock which one sets going. The idea encourages the poet to construct automated and flawless machines. Such poems have thousands of intricately moving parts, dozens of iambic belts and pulleys, precision trippers that rhyme at the right moment, lights flashing alternately red and green, steam valves that whistle like birds. This is the admired poem…The great poets of this century have written their poems in exactly the opposite way.